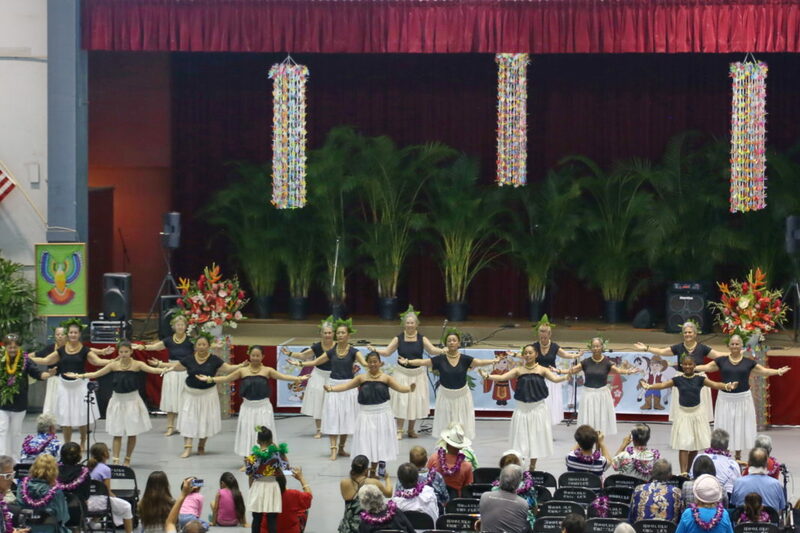 The 9th annual Hilo World Peace Festival was held on Saturday, Oct. 20, at the Afook-Chinen Civic Auditorium. More than 1,000 citizens and visitors attended the Festival in the largest city on the Big Island of Hawaii. The annual event celebrates cultural diversity and promotes the creation of a peaceful world through performances; opportunities to experience cultural expressions of dance, music and art: and plenty of delicious food and beverages. 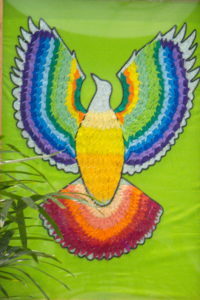 The Hilo World Peace Festival was created in 2010 to promote the spirit of “Aloha”—the universal language of love—which encourages acts “to honor and revere our elders”; to love, nurture, and protect our children; and to respect the harmony of our families, thus creating a healthy community and island lifestyle. It is a partnership event coordinated by the County of Hawaii, Destination Hilo, Soka Gakkai International USA and the International Committee of Artists for Peace. The indoor venue, able to hold thousands, displayed the flags of 194 countries, accenting the global importance of their local efforts for world peace. Also present was a moving series of antiviolence graphic displays provided by the youth initiative “Victory Over Violence.” Beautiful origami paper cranes provided a lush background for the stage performers while festival attendees were greeted by bouquets and traditional Hawaiian leis. Many people, including the Mayor of Hawaii County, Harry Kim, and his staff expressed their appreciation for the numerous volunteers working behind the scenes, who made this year’s Festival a great success. Penny Keli Vredenburg, the emcee, informed the audience that, characteristic of the event’s international nature, it was attended not only by local Big Islanders but by residents of Canada, England, Japan, and the Continental United States, who had come specifically for the Festival. After welcoming the attendees and participants, Ms. Vredenburg introduced Kumu Hula (master Hula Dance Instructor and Cultural Advisor) James “Kimo” Luluhiwalani Awai III. 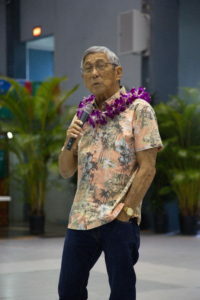 Through a participatory Hawaiian call and response, Mr. Awai unified the participants in light of the Festival’s purpose of creating a peaceful world. Mayor Kim was then invited to speak. Greeted by warm applause, he reaffirmed Hawaii’s multiracial and multicultural nature—the recognition that we are from all people and responsible to all people. The mayor recounted how he had recently visited a school and had shared his experience growing up and learning about the cosmopolitan ideal—the concept of being free from local ideas and prejudices, of belonging to all the world, of how there weren’t actually different people, nationalities, races, cultures, or religions; and he related that he felt sad not many students understood that. 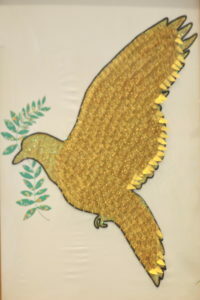 This World Peace Festival, he emphasized, plays a very important role in uniting cultures and religions through song and dance and breaking down artificial barriers. The mayor also talked about kuleana—one’s personal sense of responsibility—and about how the Festival could spark a great revolution in opening up dialogue and culture among peoples. Festival performances, which ran for hours, presented an entertainment line-up including Kimo Awai and the Hilo Soka Gakkai Hula Group, Lopaka & Friends, DD and the High Rollers, Iwalani Kalima with Hula Halau O Kou Lima Nani E, and Taish oji Taiko. Festival sponsors had booths set up around the periphery, where additional information about their activities could be obtained. And local culinary treats delighted the attendees. 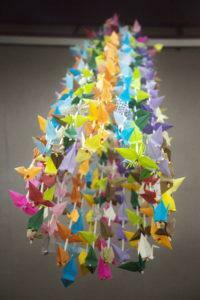 Annett Uyeda, a local peace activist and the volunteer group she led undertook the creation of the thousands of origami paper cranes that graced the stage. Mayor Kim was so touched by the beautiful art work that he suggested them to be on display in the County office building lobby.